This basic risotto recipe can be modified in many tasty ways. You can also reheat leftovers in a microwave oven. While heating the stock, throw in about an ounce of dried porcini mushrooms. After the mushrooms have reconstituted, remove and squeeze excess liquid back into the stock. Then treat the same way as the shiitake mushrooms at step 2. Omit the mushrooms. 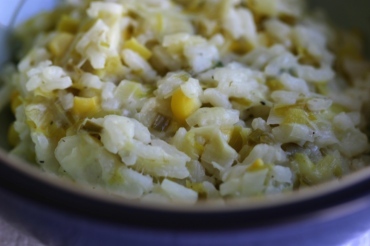 Instead use dry-sautéed zucchini, stirred in at step 9. If you want a chunky vegetable other than mushrooms or zucchini, try peas, cooked fava beans (a.k.a., broadbeans), or cooked edamame. Remember to discard the shells of such legumes, unless they’re very tender like snowpeas. Corn kernels and chopped roasted beets go well, too. Use 2 to 3 leeks, including the green tops, instead of onion. Use shallots instead of the onion or garlic. Instead of arugula, use baby chard, pea sprouts, pepper cress or watercress. Heat the stock and saffron in a saucepan until simmering. Keep this at a low, gentle simmer. In a frying pan, dry sauté the mushrooms in the butter until browned. Set aside. In a dutch oven or stock pot, heat the oil. Add the onions and garlic to the dutch oven and sauté over medium-high heat until translucent. Add the Arborio rice to the dutch oven and stir for a minute so that the grains are well coated. Add the wine to the rice and stir until it is absorbed. Add the stock, about 1/2 to 1 cup at a time, to the rice. Again, stir until the liquid is absorbed. Test the rice periodically until it is al dente —neither mushy nor gritty. This step takes about 20 to 30 minutes overall. Add salt to taste, but keep in mind that the cheese adds some saltiness. Stir in the mushrooms. Turn off the heat. Stir in the arugula, then cheese. Serve immediately. This was written by sairuh. Posted on Wednesday, August 23, 2006, at 5:15 pm. Filed under Food. Tagged cheese, Italian, mushrooms, recipe, rice, vegetarian. Bookmark the permalink. Follow comments here with the RSS feed. Post a comment or leave a trackback.